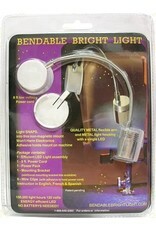 Bendable Bright Light - going batty! Bendable Bright Light snaps into a magnetic mount adhesive that won't harm electronics. Quality metal flexible arm and metal light housing functions with a single LED. Includes: efficient LED light assembly, 8 ft power cord, power pack and a mounting bracket and 6 wire clips. 100,000 light hours and 120 volts. No batteries needed!